The end of January saw the first in a series of themed "Secret Suppers", held at the hall in order to raise funds for the new extention. If this is a sign of things to come seats for future meals will bemuch sought after. Thanks must go to Tanya, Carole and Julia for cooking and serving the meal, also to Marie and John fot their assistance. 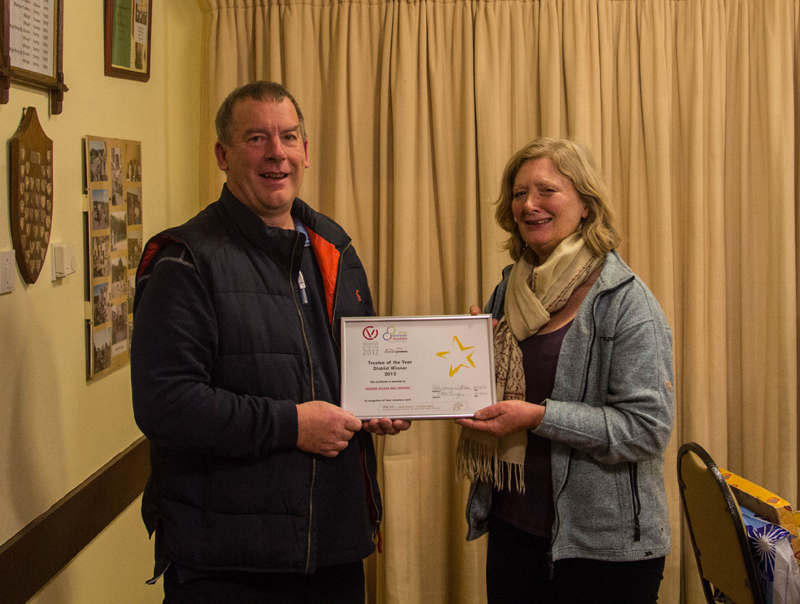 Richard Maxwell receiving a certificate from Pat Diango on behalf of the trustees of Filleigh Village Hall. 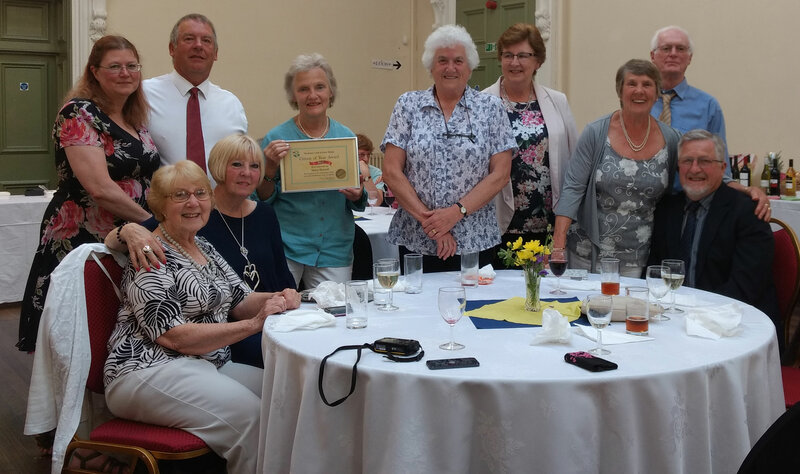 Pat is from NDVS and came to present the DACVS 'Trustees of the Year Award 2012', for which they won the Distict award. Read more here. 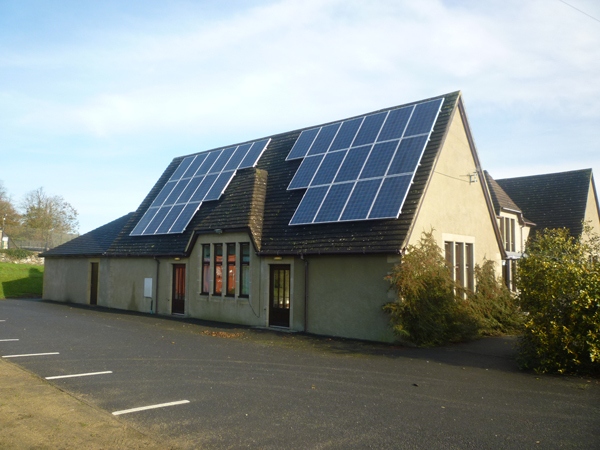 We have had 30 photovoltaic cells recently fitted to the hall. 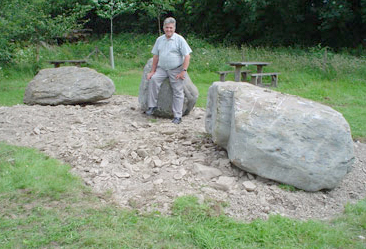 These were fitted by a local firm Earth Elements www.earthelements.co.uk and are part of our 'Green Dream' to cut down our use of non renewable resources. In the future we hope to install an air-source heat pump to reduce our oil usage for heating. We commissioned a local artist Vic Bailey together with Geoff Boucher to paint a mural on the large wall above the doors leading from the main hall into the meeting room. We wanted the mural to represent the main features of Filleigh. 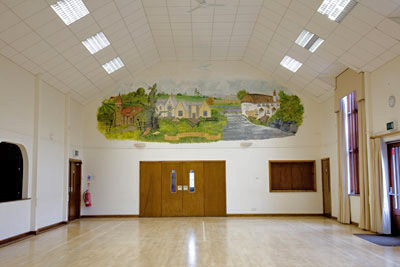 We are very pleased with the result and it adds a focal point to the hall. The Filleigh History Group meet every 4th Wednesday. or Tanya Hussell tel. 01598 760332. Come and try this new sport for our hall. If you decide to join, there will be an annual membership fee of £5.00 each. This includes the official Rule Book and an occasional newsletter. There is a charge of £1.50 per evening, which will include tea/coffee and biscuits and use of the Village Hall Bowls. To safeguard our new mats, ordinary footwear or socks will not be allowed and proper bowling shoes must be used at all times. We will be able, on a temporary basis, to provide special overshoes (at a small charge of 20p). The minimum age will be 10 years and children must be accompanied by an adult at all times. If you would just like to have a game of pool rather than play bowls then the pool table is available for use on the same evening. The same charge of £1.50 per person will apply. Come and take the opportunity to learning Ballroom Dancing. These classes are held every Wednesday night in the hall. 7.00 - 8.00 pm. for beginners followed by a class for improvers from 8.00 - 9.00 pm. So if you want to keep fit and have fun - come and Dance the Night Away. If you want to learn or just brush up on your dancing skills then come and join Judy on Wednesday nights. Phone 01769 572384 or 01271 325800 for more details. If Ballroom dancing is not for you then try Modern Sequence Dancing - same time, same place, same contacts but on a Tuesday night. If anyone comes across any old photographs of Filleigh and the surrounding area or any other items of interest please contact Beryl Morgan (01769 579948) , so that she can record and add them to the collection. With luck we hope to get a grant to enable us to safely store the collection so that it can be put on regular display. 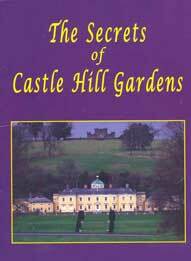 During August 2003 there was the very first opportunity to see and purchase the book 'The Secrets of Castle Hill' which was written by the members of Filleigh History Club and contains amongst other gems many, previously unpublished, drawings and pictures of Castle Hill. The book will be sold in aid of North Devon Hospice and other local charitable organisations. Copies can be obtained by post at the price of £3.40. Telephone 01769 579948 . For further details of the book.